Apr 10 Unconditional Love… Gabby Joins Wade’s Son for Support at Pride Event!!! First Name Tom, Last Name Foolery… And I’m Everybody’s Uncle! Especially loving stepmom… Gabrielle Union. Gabrielle Union has nothing but love for everyone, including her stepson Zion Wade. The "Breaking In" star showed support for Dwyane Wade's son at the Miami Beach Gay Pride celebration with his family on Sunday, April 8 in place of the NBA star who couldn't attend the event. 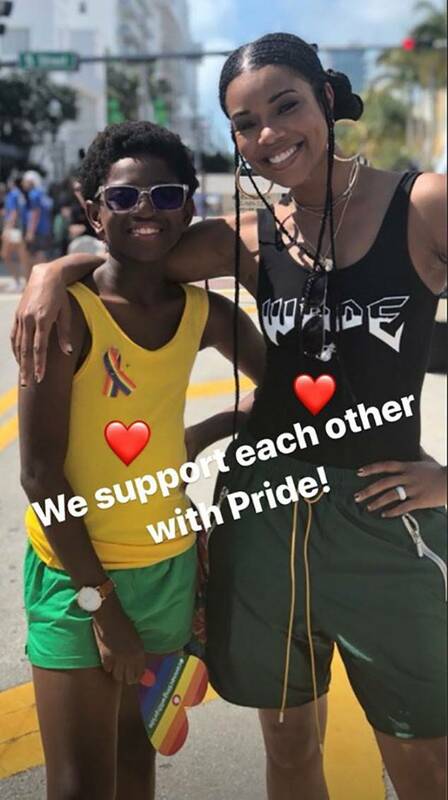 As Dwyane was currently in Toronto for a game, Gabrielle made sure that his 11-year-old son felt the support he'd intended to give by personally going & joining him at the Pride event. Also present at the parade was his older brother, Zaire Wade. Climb on The Family Tree below & share your thoughts about My Niece Gabrielle Union’s supporting situation. Uncle Tom Foolery is an online entertainment company that thrives to report breaking news in a satirical fashion. In today's technology driven society, it's great to have an uncle you can always count on to provide you with a steady dosage of viral foolery. Porsha Williams & Family Celebrate Their 1st Easter!! Chile… Is Tamar Braxton Becoming a RHOA!?!?! Apr 12 Larsa Pippen Gets Plastic Surgery to Look Like Kim Kardashian!!! Apr 10 Wow… Magic Johnson Abruptly Resigns!!! Jan 1 Gabby & D-Wade Channel Miami Vice for New Year's Photo Shoot!!! Jan 23 Southern Pride or Racism... Student Suspended for Wearing Confederate Flag Attire!!! Apr 14 Tiger Roars to 5th Masters Victory! !